Heat the oven to 325 degrees. If your fennel bulbs are not trimmed, cut the stalks and fronds off the bulbs (I like to save them to chop up and add to vegetable soup). Cut each bulb in half, then cut each half into 4 wedges, being careful to leave a little of the root end on each wedge so that the layers will stay together. Lay the wedges in a small baking dish (some may overlap), drizzle with the salsa macha and 1/4 cup water. Sprinkle with about 1 teaspoon salt. Cover tightly with foil and bake until thoroughly tender, about 1 hour. Alternate: To cook the fennel in a “hobo pack” on the grill: Cut 2 pieces of heavy-duty foil about 30 inches long. Lay the fennel over one half of the foil, drizzle with the salsa macha and sprinkle with the salt. 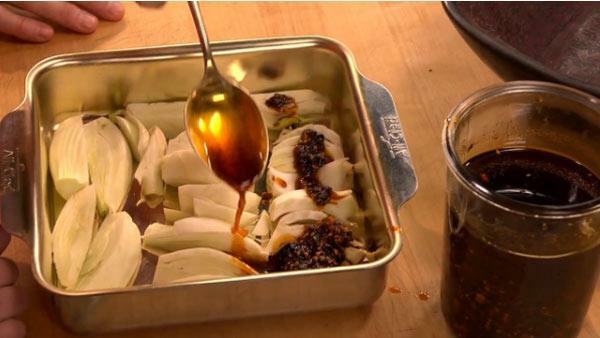 Fold up the foil a little around the fennel and drizzle on the water. Fold the other half of the foil over the fennel and crimp tightly. Lay on the grill (some prefer to lay it directly in the coals, but I’ve found they can be too hot for this preparation). Turn the package every few minutes until the fennel is tender, usually about 35 minutes.